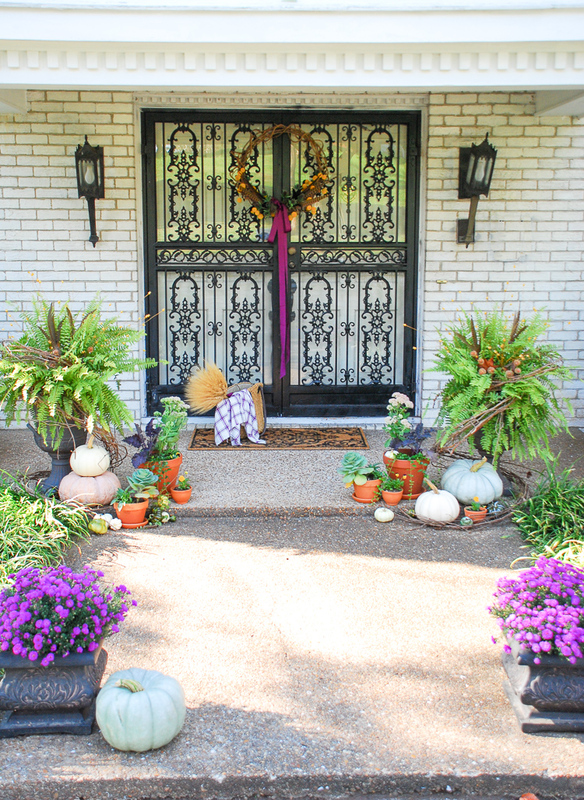 Elevate your curb appeal by adding autumn charm at the front door with punches of purple, heirloom pumpkins, terra cotta pots, fall plants, and festive ferns. Happy Fall Y’all!!! It’s that time of year again…the time for pumpkins, autumn leaves, crisp, cool air, bonfires, family gatherings, cider, and plaid everything!!! Can you tell how excited I am? Did I use enough exclamation marks? 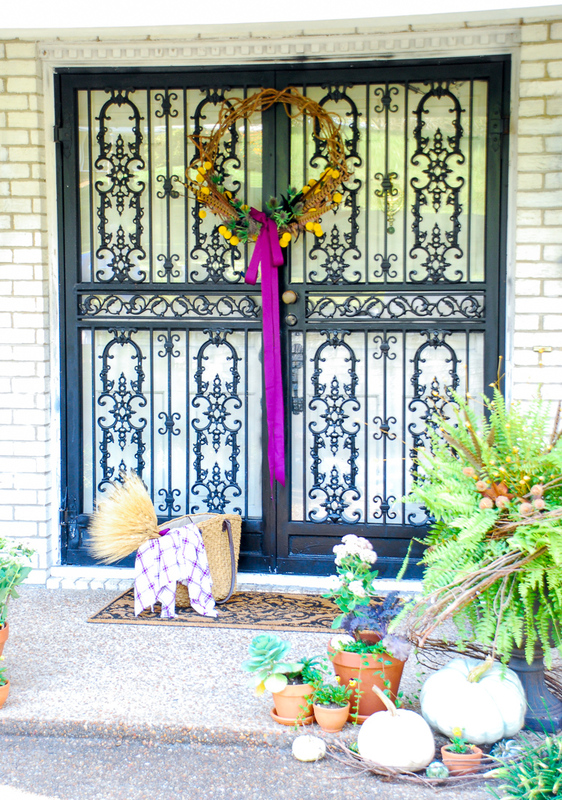 😉 I am equally excited to share my front porch all decked out for fall with you and three tips to help you elevate your curb appeal by adding autumn charm at the front door. I’ve been eagerly waiting for my local garden centers to get pumpkins in for the season, and last weekend they arrived. 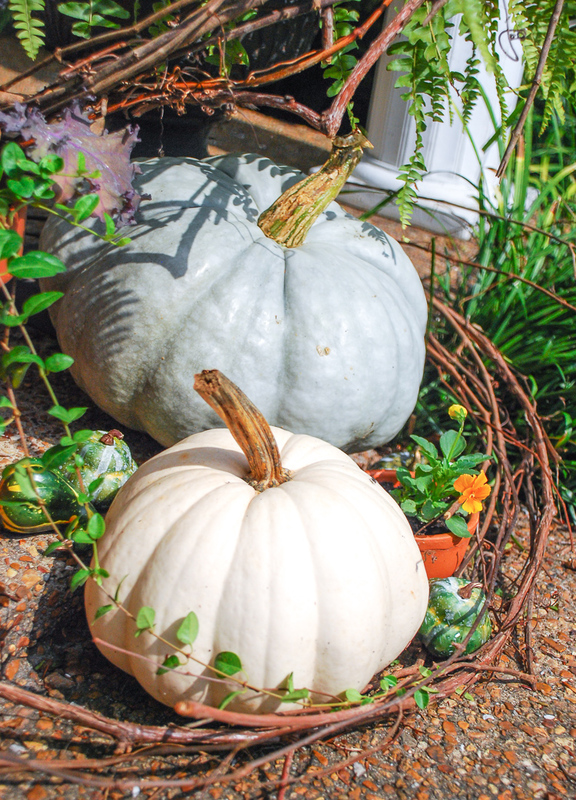 So of course early Saturday morning I headed out to select the perfect pumpkins to transform my ho-hum front door. This year my fall decor look is all about the autumn harvest, repurposing, and purples, particularly the on trend magenta and fig. Last year you may remember my fall decor was all about gingham. 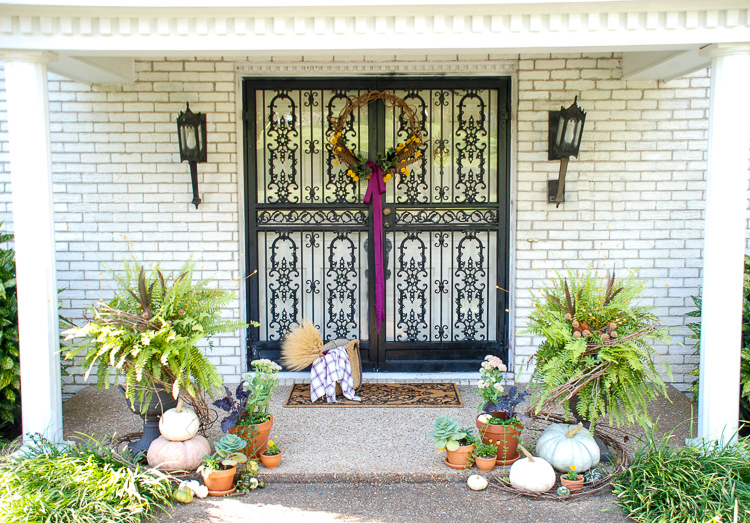 See last year’s fall home tour here. It can be tempting to go out and buy new seasonal decor each year, but I am a firm believer in repurposing what you already have, so this year I decided to prolong the life of my ferns by transforming them into festive fall planters. 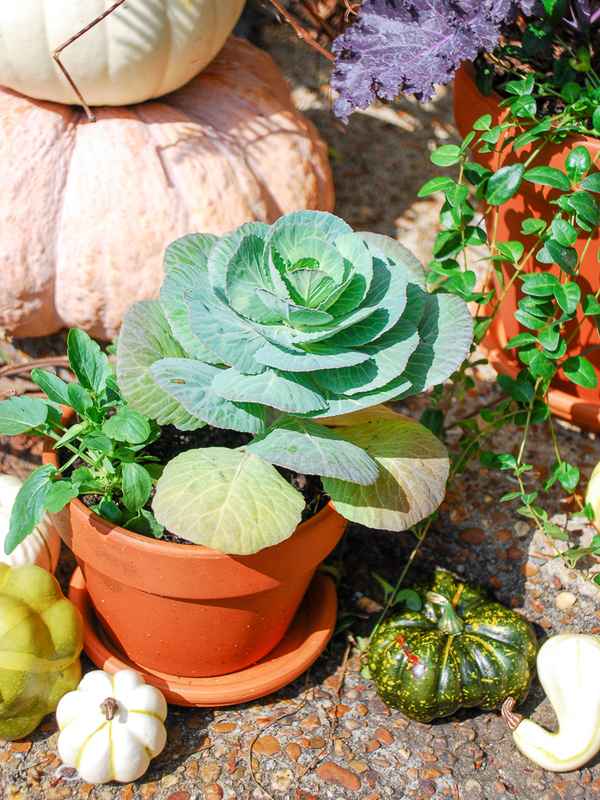 Then I added a few more fall plants with the pansies, kale, cabbage, and asters in terra cotta pots. Next I layered in heirloom pumpkins and gourds, and finally hung a chic hunt inspired autumn wreath. I like an elegant traditional look for my fall decor, and I think I achieved just the right amount of autumn charm at the front door! No. 1 Try subtle touches of asymmetry. I prefer symmetry, order, and balance, but every once in a while I remind myself to let loose and try something different. Without going over board, I choose to arrange my fall front door with subtle touches of asymmetry for something different. By and large the arrangement is very balanced with each side having the foundational elements of a pot of aster, a fall fern planter, terra cotta pots, and heirloom pumpkins, but the placement on each side is slightly different. These touches of asymmetry add visual interest and make the autumn tableau look less formal and more relaxed, while still maintaining balance and a traditional feel. 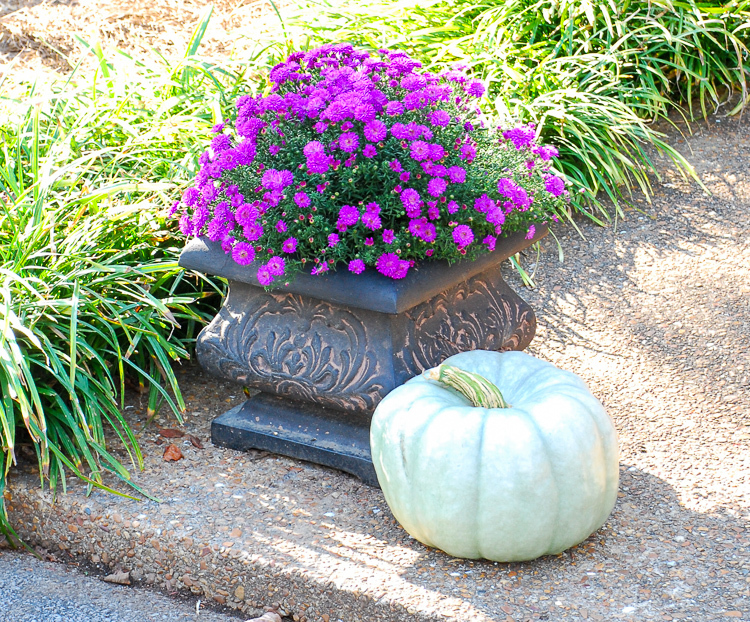 Try adding asymmetry to your fall decor and see what happens! No. 2 Use a neutral, earthy palette with a punch of bright color. Neutrals are very popular right now with everyone in love with the white pumpkin, and I admit it is pretty darling, but I love autumn’s vibrant splash of color. 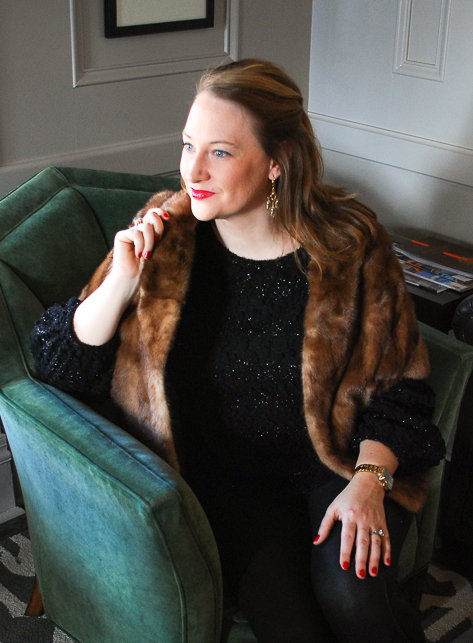 I just can’t go completely neutral with my fall decor nor do I want a crazy clash of colors, so this year I decided to pare down my vibrant hues to one – purple – and mix in more earthy, neutral tones. This color choice is sophisticated but still fun, and it allows me to play with autumn’s vibrant hues without going crazy. So my advice is to pick your favorite autumnal hue, deep red, bright orange, or dark magenta, and add small punches of it throughout your fall decor, then let the rest of your choices be more soft and neutral. No. 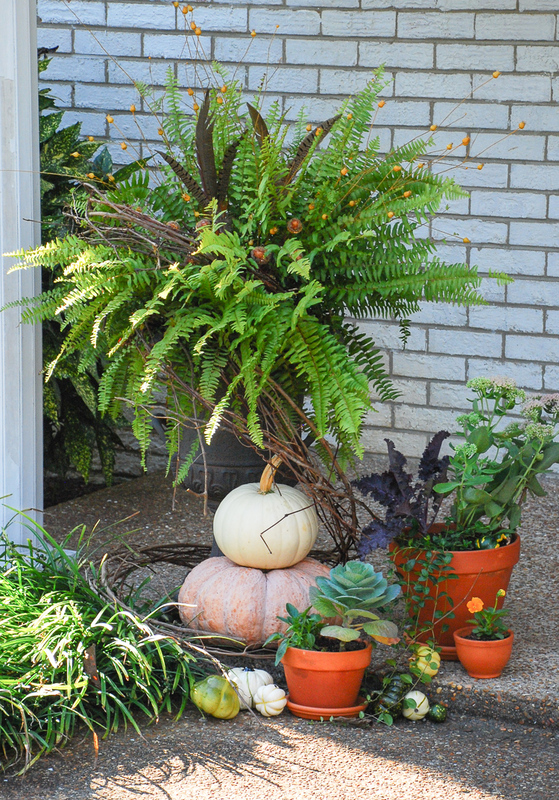 3 Transform summer ferns into festive fall planters. 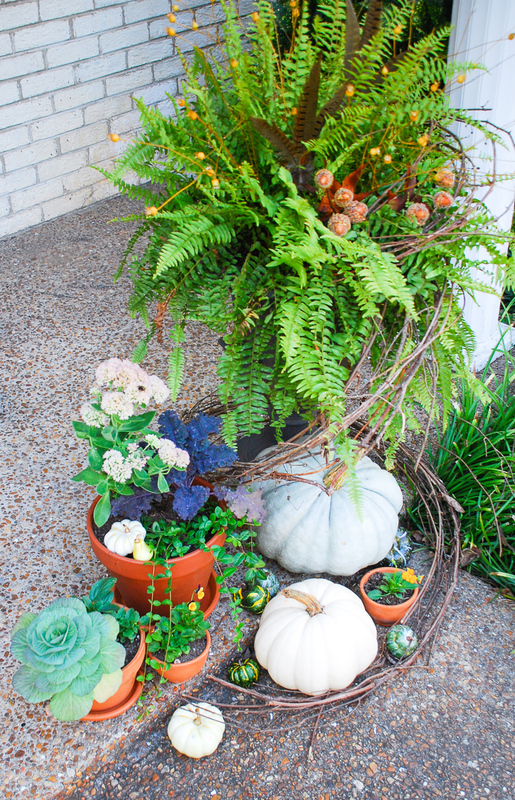 For me ferns are a classic feature on a Southern porch each summer, and I just couldn’t justify removing these beauties for my fall decor this year, so I added a little autumn charm! 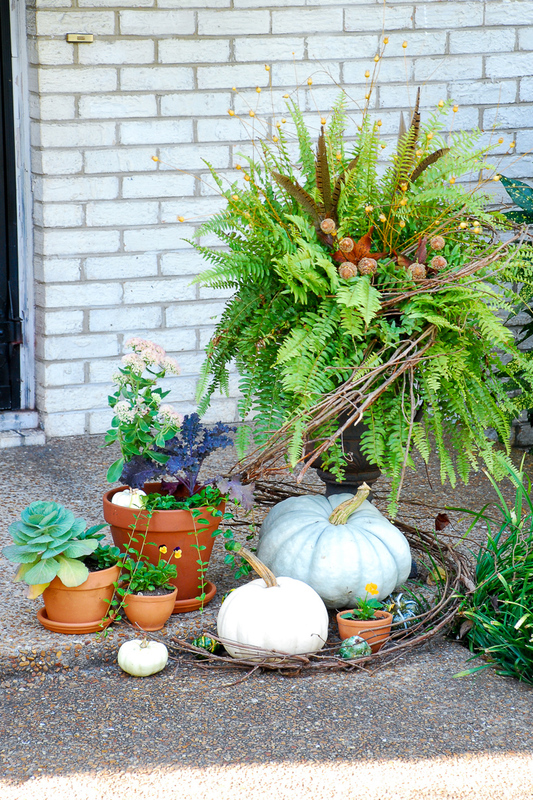 With some grapevine garland, pheasant feathers, acorns, and fall foliage I transformed my summer ferns into festive fall planters. 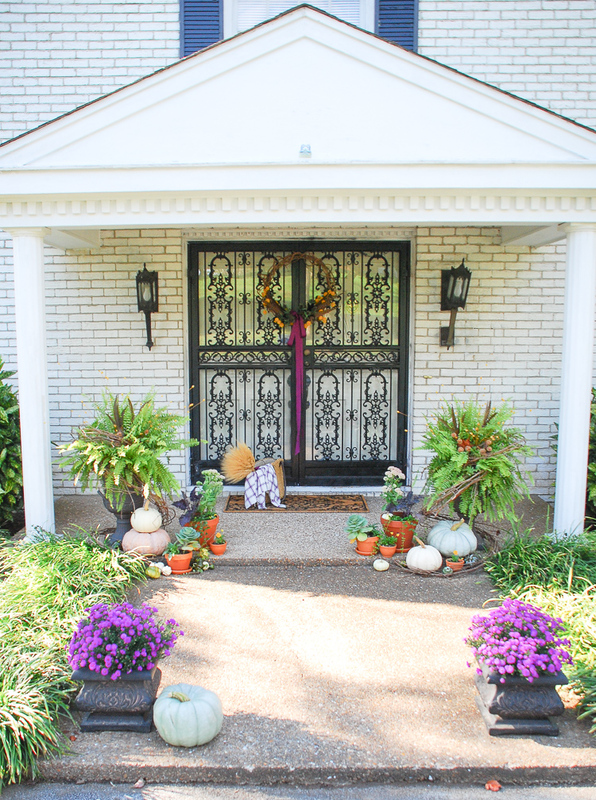 I’m sharing how I made the grapevine garland and the steps to transforming these summer ferns at the end of the post. 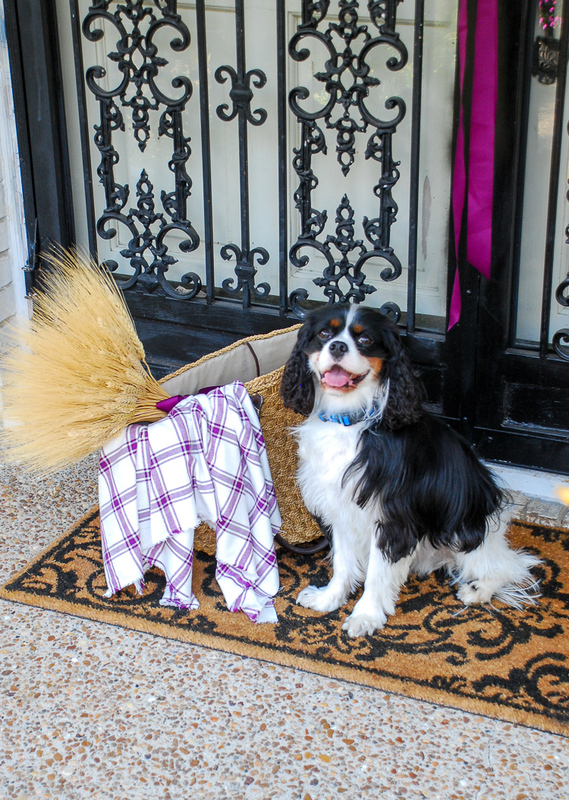 Henry just snuck in to wish y’all a happy fall! You will need a grapevine wreath for each planter. First unravel the top grapevine branch that is holding the wreath together. Then start to pull the wreath apart. Keep pulling until you have a long coil of grapevine. Cut the coil into three pieces: a short piece for the first loop of garland that will go in the top of the fern; a longer coil that will wrap around the fern and planter; and the last piece should be the end circle. Stick the first short section into the base of the fern at the back of the planter. Pull the other end diagonally across the fern and stick it in on the opposite side. Take the longer coil and stick it in the side and wrap it around the planter. To finish off these festive fall planters add a mix of autumnal accents like feathers, fall foliage, acorns, seed pods, etc. You can use the third section to add fullness to a thin section of the grapevine garland or make something else with it. 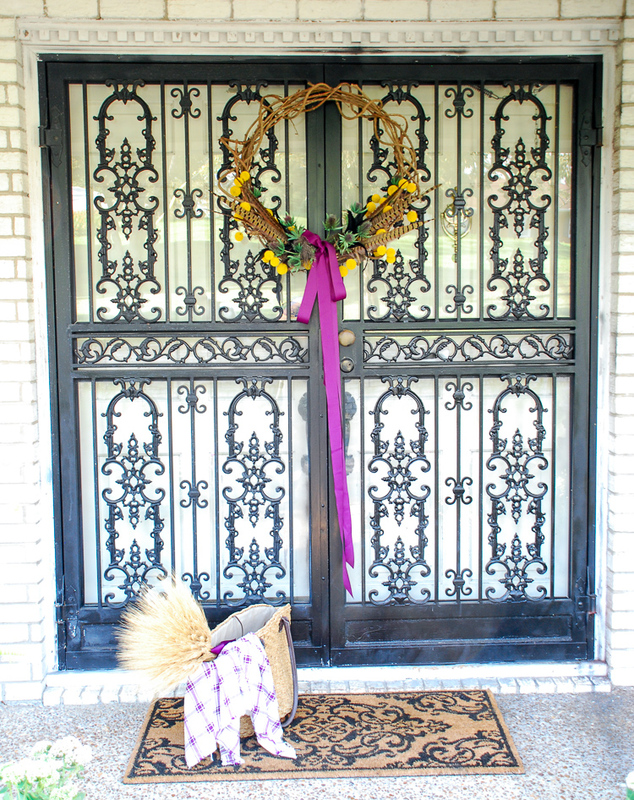 I used the two ends sections to make my grapevine wreath on the door. 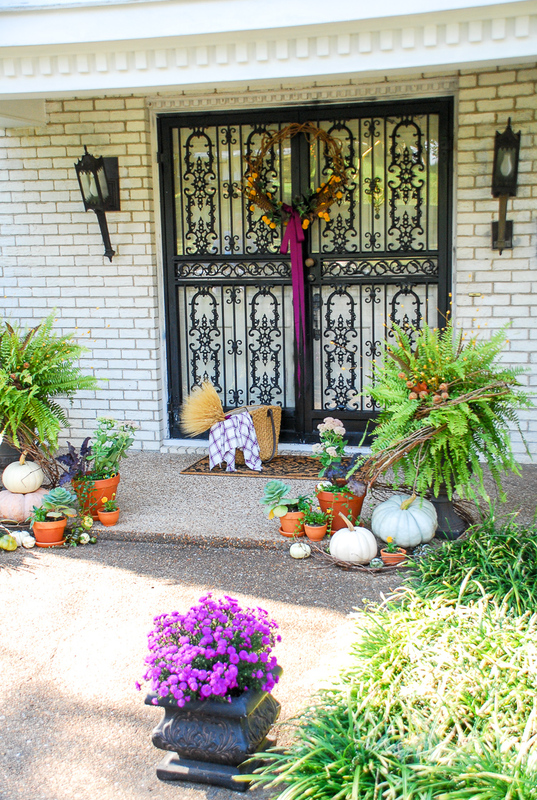 I hope this posts inspires you to add some autumn charm at the front door! Henry is adorable! Thanks for sharing the tips and your front door is beautiful. Thanks so much Sandra!! He is a charmer!